If you keep receiving intrusive Remembergirl.com popups, while browsing online using the Mozilla Firefox, Internet Explorer, Chrome and MS Edge, then you need to know that your web browser has become the victim of the potentially unwanted application (PUA) from the adware (sometimes named ‘ad-supported’ software) category. The adware can end up on your system in various ways. In most cases is when you download and install free programs and forget to uncheck the box for the third-party applications installation. Do not panic because we’ve got the solution. Here’s a steps on how to remove Remembergirl.com ads from the Google Chrome, IE, Mozilla Firefox and Edge and other internet browsers. In order to remove Remembergirl.com pop-ups, start by closing any programs and popups that are open. If a pop-up won’t close, then close your internet browser (Internet Explorer, Chrome, Firefox and Edge). If a program won’t close then please restart your PC system. Next, follow the steps below. Most common ad supported software may be deleted without any antivirus software. The manual adware removal is steps that will teach you how to remove the Remembergirl.com pop up ads. First method for manual adware removal is to go into the MS Windows “Control Panel”, then “Uninstall a program” console. Take a look at the list of apps on your machine and see if there are any dubious and unknown apps. If you see any, you need to uninstall them. Of course, before doing so, you can do an Internet search to find details on the program. If it is a potentially unwanted program, adware or malicious software, you will likely find information that says so. It will display a list of all apps installed on the system. 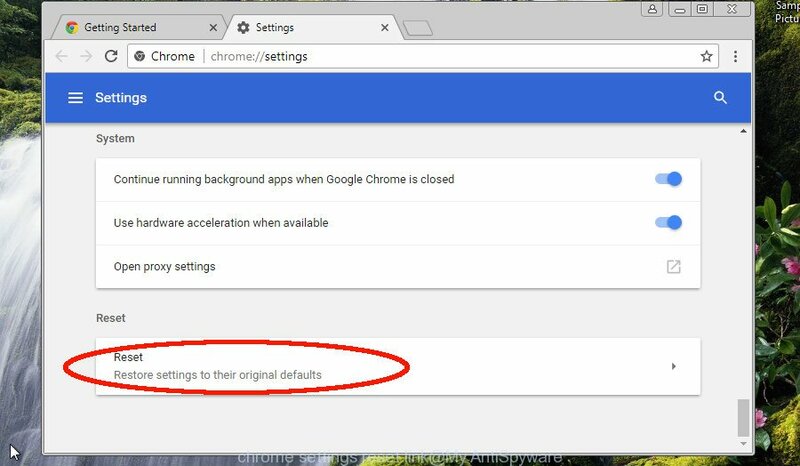 Run the Reset web-browser utility of the Chrome to reset all its settings such as search provider by default, newtab page and start page to original defaults. This is a very useful utility to use, in the case of web browser redirects to annoying ad web-sites such as Remembergirl.com. Carefully browse through the list of installed addons. If the list has the plugin labeled with “Installed by enterprise policy” or “Installed by your administrator”, then complete the following instructions: Remove Google Chrome extensions installed by enterprise policy otherwise, just go to the step below. 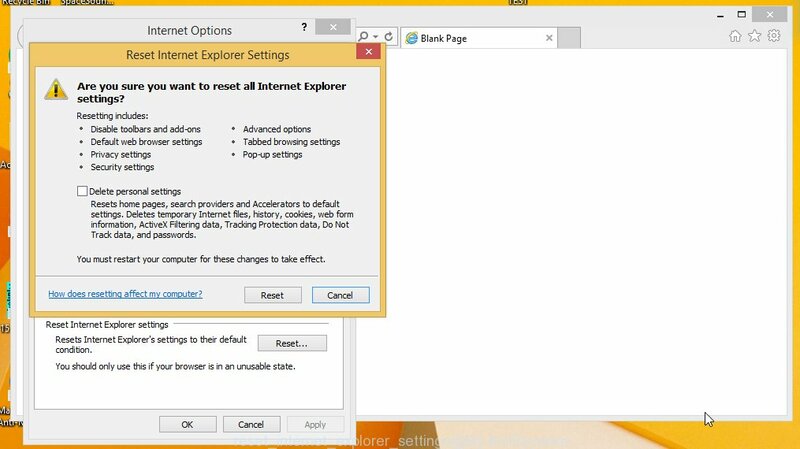 By resetting IE browser you restore your web browser settings to its default state. This is good initial when troubleshooting problems that might have been caused by adware which redirects your internet browser to intrusive Remembergirl.com page. First, start the Internet Explorer, then click ‘gear’ icon . It will show the Tools drop-down menu on the right part of the browser, then click the “Internet Options” as shown on the image below. When the task is done, click “Close” button. Close the Microsoft Internet Explorer and reboot your machine for the changes to take effect. 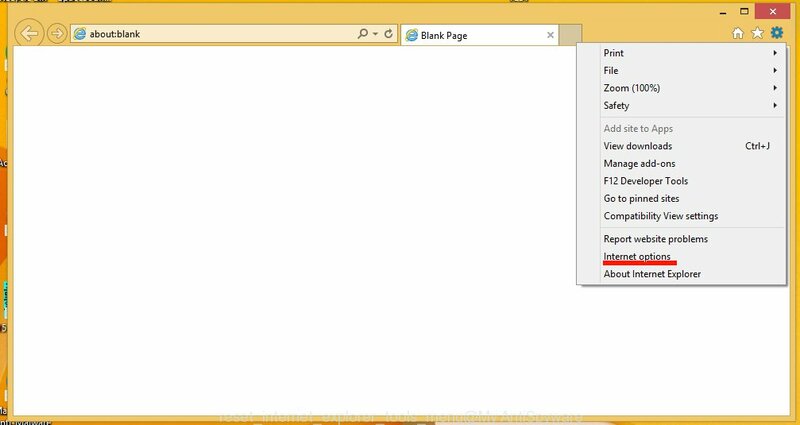 This step will help you to restore your web browser’s default search engine, homepage and new tab to default state. 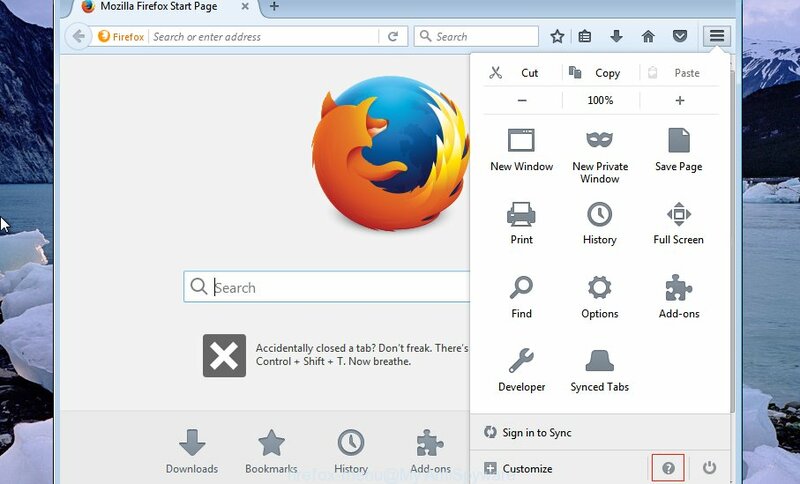 If your Firefox web-browser is re-directed to Remembergirl.com without your permission or an unknown search engine displays results for your search, then it may be time to perform the web-browser reset. Essential information like bookmarks, browsing history, passwords, cookies, auto-fill data and personal dictionaries will not be removed. Anti-Malware apps differ from each other by many features such as performance, scheduled scans, automatic updates, virus signature database, technical support, compatibility with other antivirus programs and so on. We advise you use the following free programs: Zemana Free, MalwareBytes Anti Malware (MBAM) and HitmanPro. Each of these programs has all of needed features, but most importantly, they can identify the ad-supported software and remove Remembergirl.com popups from the Internet Explorer, Chrome, Mozilla Firefox and Edge. You can download and use the Zemana Anti-Malware (ZAM) for free. This antimalware utility will scan all the registry keys and files in your computer along with the system settings and web-browser plugins. 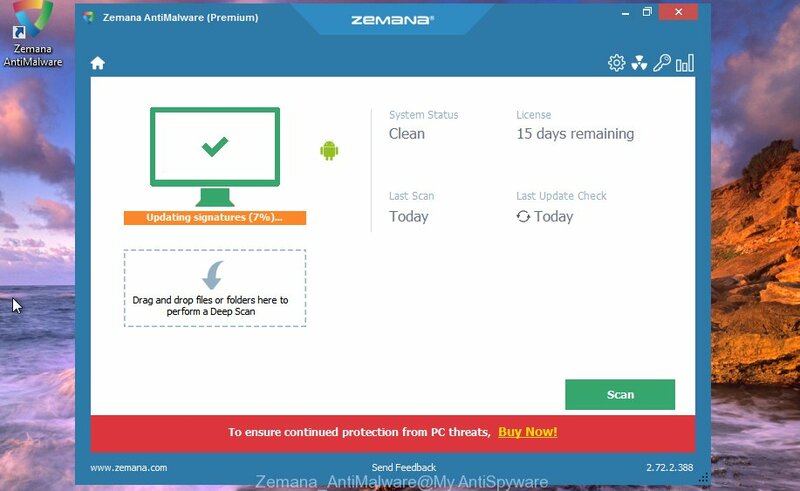 If it finds any malware, ad-supported software or harmful extension that is causing multiple unwanted advertisements then the Zemana Anti Malware will remove them from your PC system completely. Download Zemana AntiMalware (ZAM) on your Windows Desktop by clicking on the following link. After the downloading process is finished, please close all software and open windows on your computer. Next, start a file named Zemana.AntiMalware.Setup. This will start the “Setup wizard” of Zemana AntiMalware (ZAM) onto your PC system. Follow the prompts and do not make any changes to default settings. Further, press the “Scan” button to perform a system scan with this utility for the ad supported software responsible for redirecting your browser to Remembergirl.com website. Depending on your machine, the scan can take anywhere from a few minutes to close to an hour. While the Zemana Anti-Malware (ZAM) utility is scanning, you can see count of objects it has identified as being infected by malicious software. Once the scan get finished, you’ll be shown the list of all found threats on your computer. Review the results once the tool has done the system scan. If you think an entry should not be quarantined, then uncheck it. Otherwise, simply click the “Next” button. The tool will remove adware related to Remembergirl.com pop ups. After finished, you may be prompted to restart the personal computer. We suggest to install an adblocker application which can block Remembergirl.com and other intrusive sites. The ad blocking tool such as AdGuard is a program that basically removes advertising from the World Wide Web and stops access to malicious pages. Moreover, security experts says that using ad-blocking software is necessary to stay safe when surfing the Net. Follow the prompts. After the installation is finished, you will see a window as shown on the screen below. 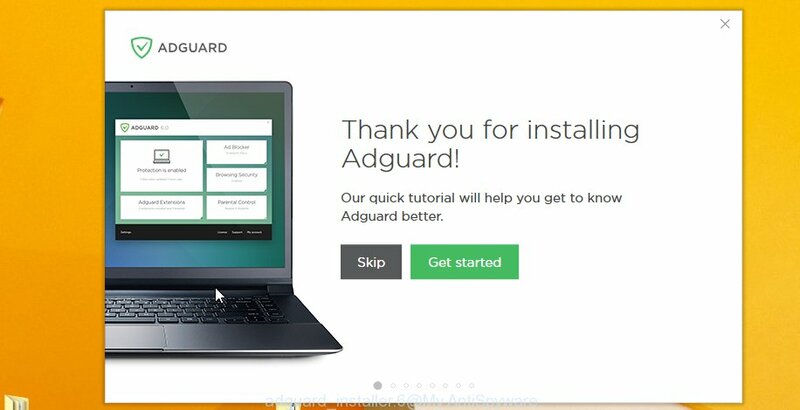 You can press “Skip” to close the installation program and use the default settings, or press “Get Started” button to see an quick tutorial which will help you get to know AdGuard better. In most cases, the default settings are enough and you do not need to change anything. 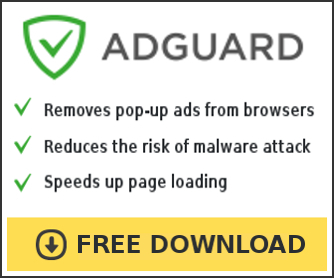 Each time, when you start your PC, AdGuard will launch automatically and block pop up advertisements, Remembergirl.com, as well as other malicious or misleading web sites. For an overview of all the features of the application, or to change its settings you can simply double-click on the AdGuard icon, that is located on your desktop. These days certain free applications authors bundle bundled applications which could be potentially unwanted software such as this adware, with a view to making some money. These are not free software as install an unwanted programs on to your Microsoft Windows computer. So whenever you install a new free program that downloaded from the Internet, be very careful during installation. 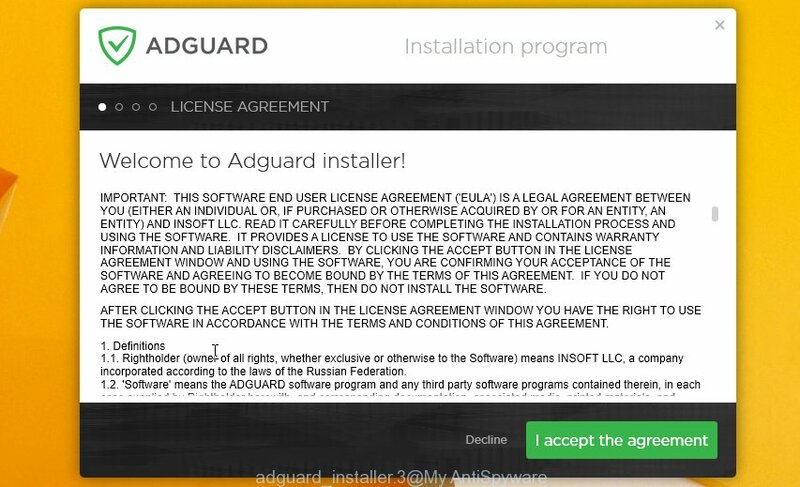 Carefully read the EULA (a text with I ACCEPT/I DECLINE button), select custom or manual setup type, disable all additional apps. After completing the step-by-step guide outlined above, your computer should be clean from this adware and other malicious software. The Microsoft Internet Explorer, Edge, Google Chrome and Mozilla Firefox will no longer open unwanted Remembergirl.com web site when you surf the Internet. Unfortunately, if the step-by-step instructions does not help you, then you have caught a new ad supported software, and then the best way – ask for help. Please create a new question by using the “Ask Question” button in the Questions and Answers. Try to give us some details about your problems, so we can try to help you more accurately. Wait for one of our trained “Security Team” or Site Administrator to provide you with knowledgeable assistance tailored to your problem with the intrusive Remembergirl.com redirect.